elphilo's blog: What do you mean it's almost Christmas?!?!?!?! So since I started my road to redemption in October, I have to make up for September. I was also given a special task to incorporate into this Vow as well. I won't say what it is, but it's there. Once it's complete I'll say what my vow is. Mainly because I don't want to spoil the surprise for others. 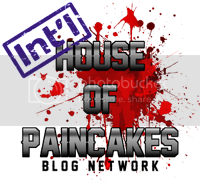 Also I have a local tournament I plan on playing in January and even though painting isn't required I want to try and get all my models ready. A group shot of Belial's Command Squad. 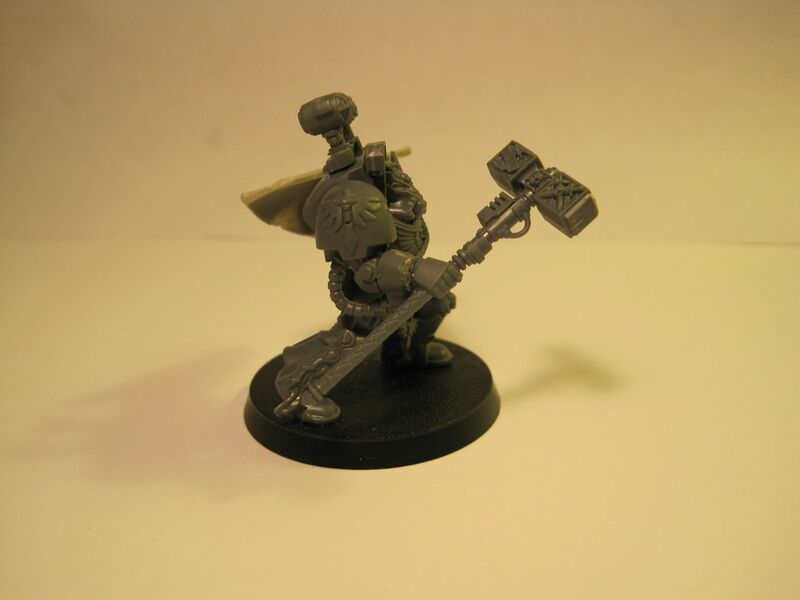 There is a Standard Bearer an Apothecary, and all of them have Thunder Hammers and Storm Sheilds. 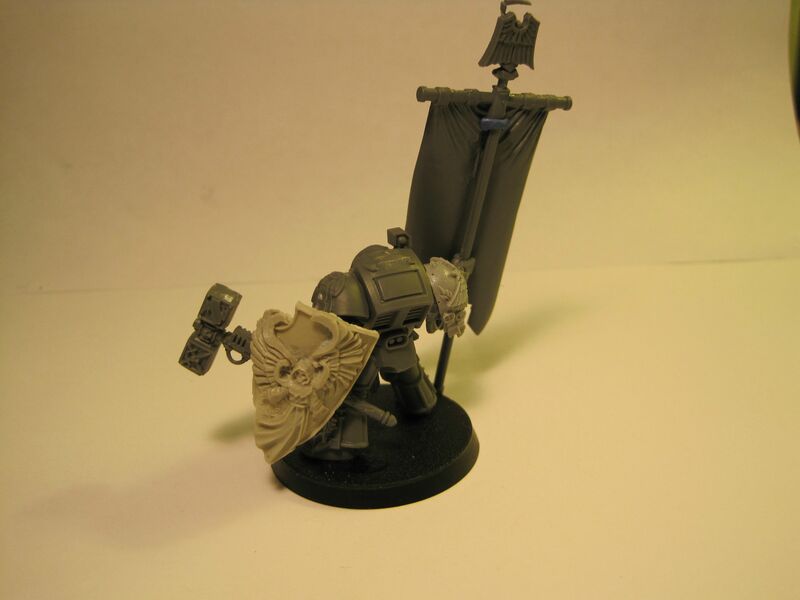 The Standard Bearer and Apothecary are not magnetized while the remaining three are. I'm not going to paint the other arms for them because I won't have enough time to do it. I'll try and get them done sometime down the road. So if you're wondering what I did for him it was rather straight forward. 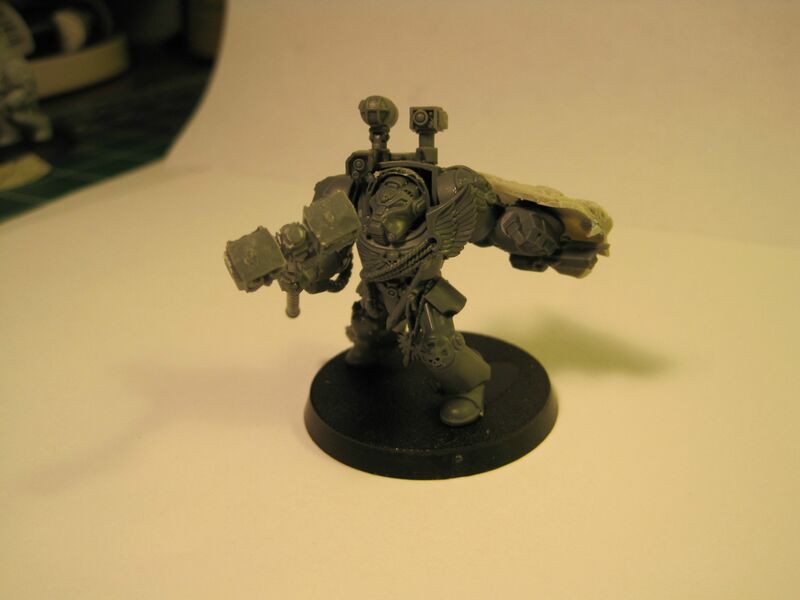 First the base model is the Assault Cannon Terminator from the Dark Vengeance box set. 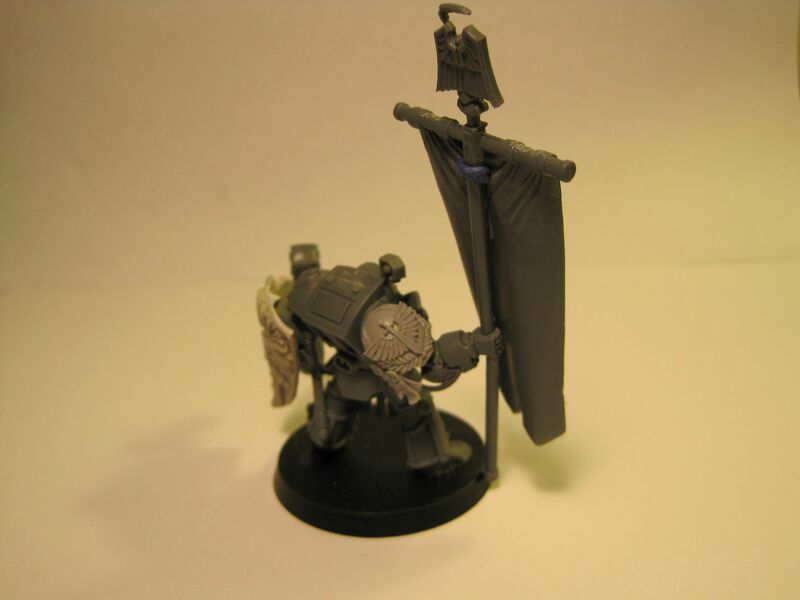 Then I switched the AC arm with a Standard Bearer Arm from the Grey Knight Terminator spure. 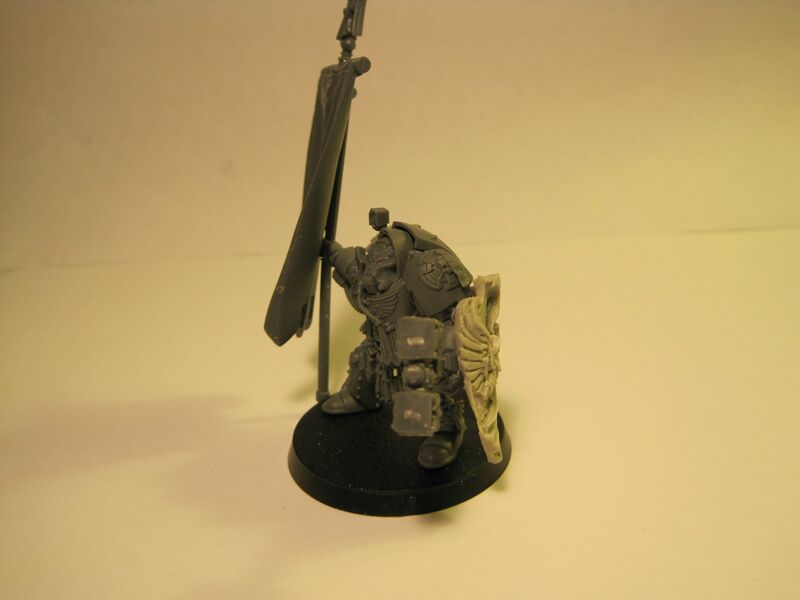 Then I cut off the hand from a Command Squad Standard Bearer and pinned that into the GK Terminator Standard Bearer Arm. I then pinned a Grey Knight Thunder Hammer into his power fist arm. And while that Storm Shield is only tacked on I like where it is so I believe it will stay there. 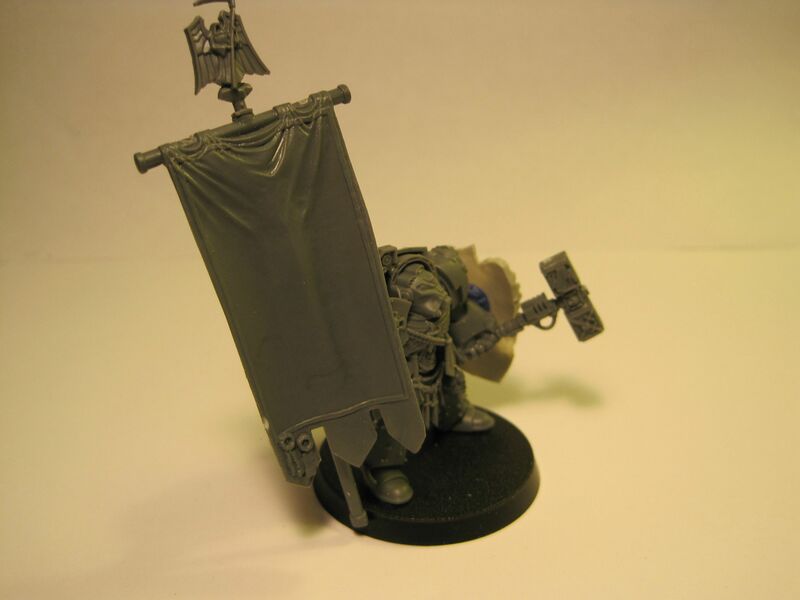 Fluff wise I'll say that in order to hold the banner and use the Thunder Hammer and Storm Shield in combat he requires the Power Fist, while in game terms he'll just be a Standard Bearer with Thunder Hammer and Storm Shield. Now you can't really see it that well from these pictures, but this Apothecary does indeed have a Narthecium, it is under the Storm Shield. Now this guy was actually surprisingly easy to do. 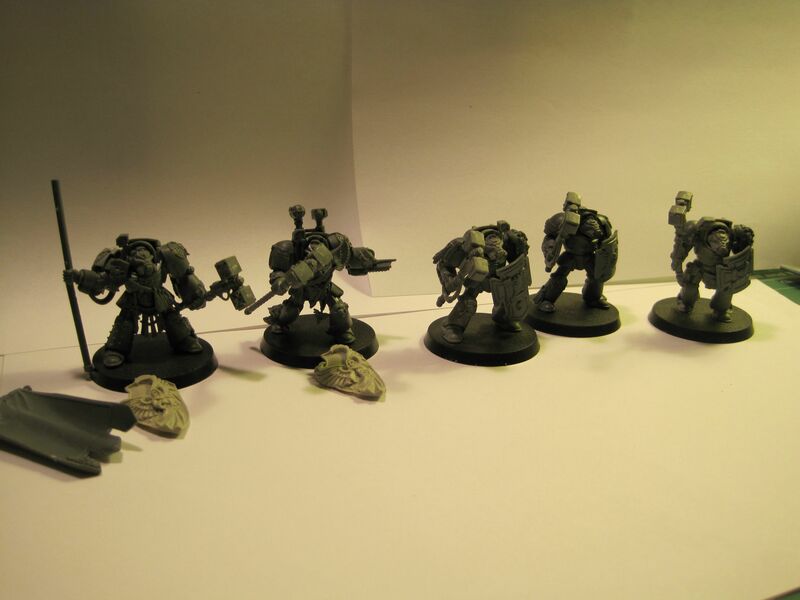 The base model is the Chain Fist Terminator from the Dark Vengeance box set. 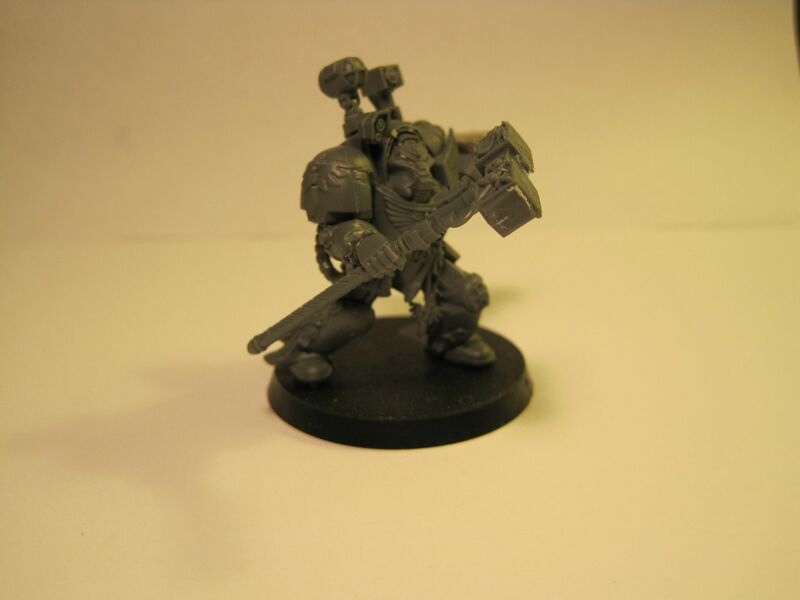 All I did was saw off his Chain Fist and his Storm Bolter hand. 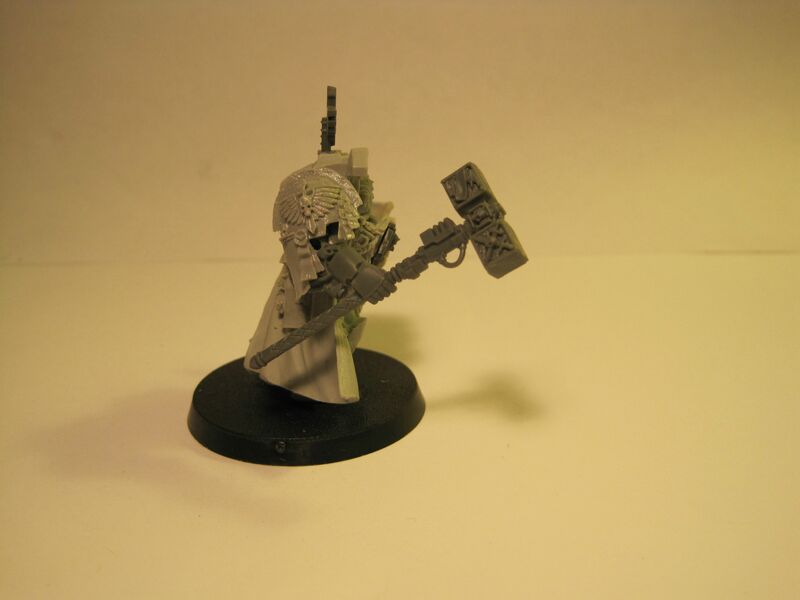 Then I sawed off the Narthecium from the Grey Knight Terminator sprue and pinned a Grey Knight Thunder Hammer. 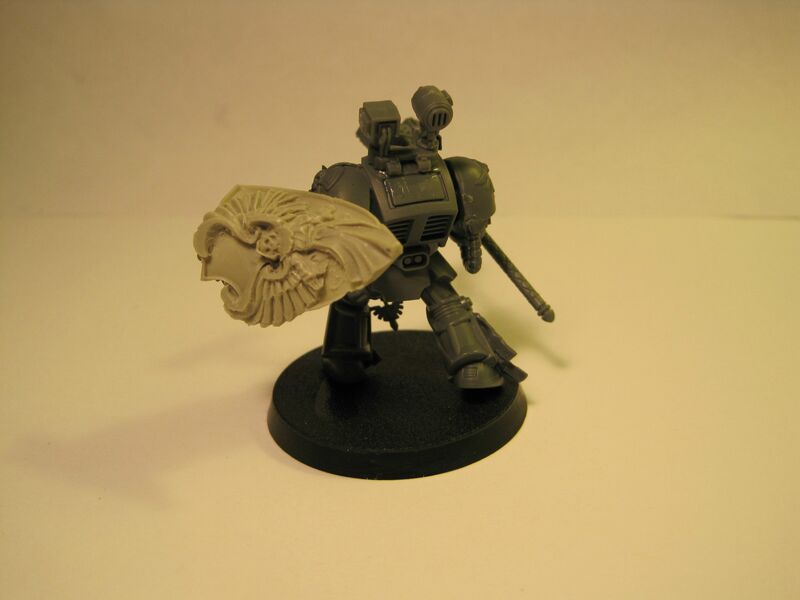 The top light is also from the Grey Knight Terminator box which makes this look much more convincing. Now I do have a Belial model, but I really hate it. I thought it looked really good, but after playing with it for a while I just don't like the conversion. 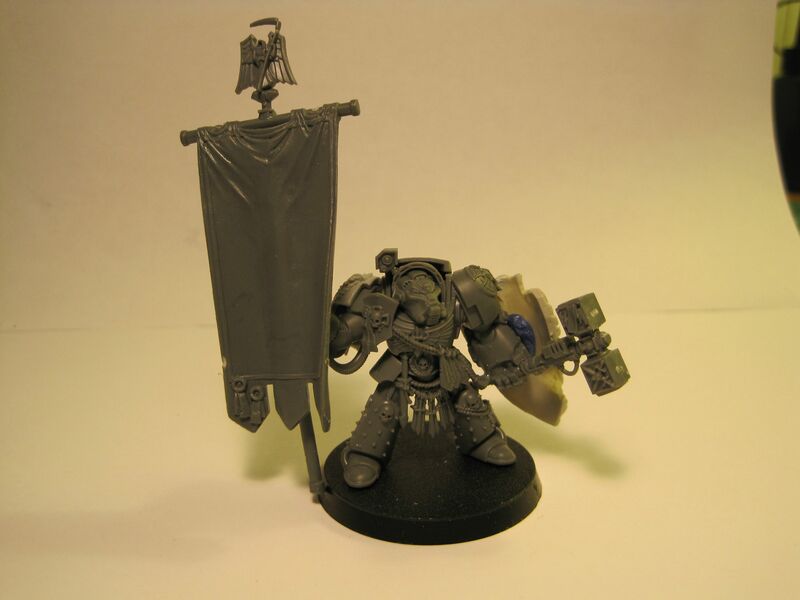 Also he is modeled with his Sword of Silence and Storm Bolter, and usually I run him with Thunder Hammer and Storm Shield So in order to prepare for the tournament I need to make a WYSIWYG conversion. With the new codex (and a new Belial model right around the corner) I thought ahead with this one. 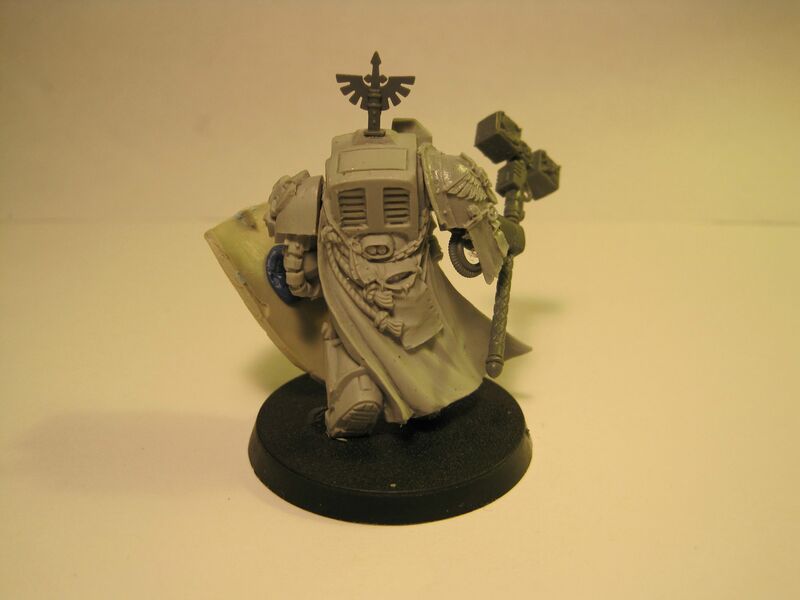 So I can better adapt for the new codex I have magnetized this model. That way if we do get a generic Captain that can wear Terminator Armor I can be ready with different load outs. 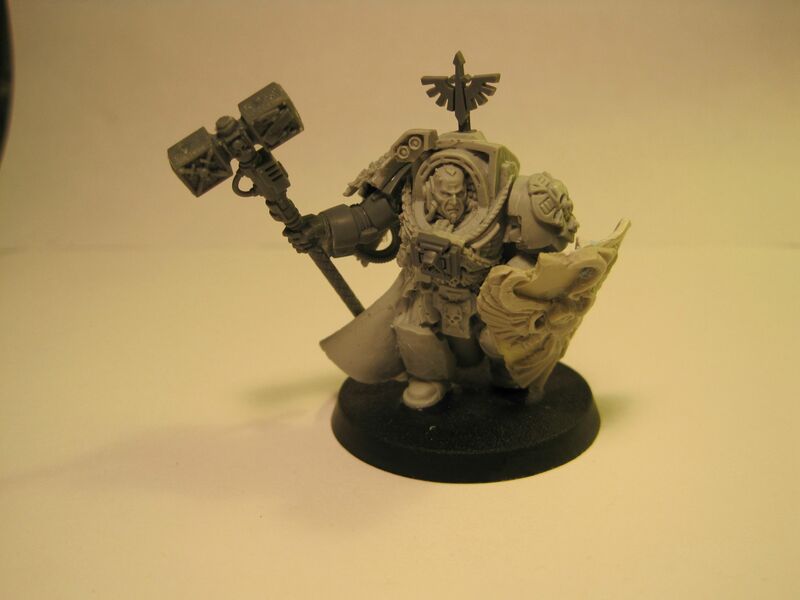 If not I have a good looking (at least I think he looks good) conversion of Belial. So yeah, he's just a Captian Lysander model with very little done. I scraped off the Iron Fist icons on his leg and chest. As you can see I replaced the chest icon with a Dark Angel's Hooded Crux Terminatus. 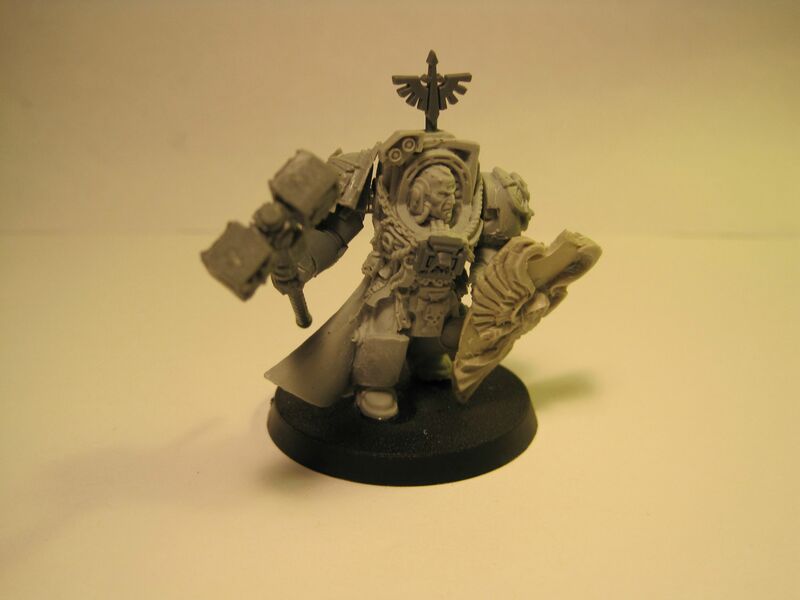 The Thunder Hammer, is once again, a Grey Knight Thunder Hammer and the shoulder pad is a Forge World Deathwing Terminator Pad. Now with the modeling done all I have to do is start painting them! I've got a awesome unfinished basement now, and the previous owner left his workbench. So I have a great place to spray paint in the winter. And with a little over a week, I think I can do it. I just have to devote a lot of time and with school being done and work finally dying down (knock on wood) I think I'll be able to do it. Once they are done I'll post pics. Until next time, be safe have fun!